Another quick update on the car. 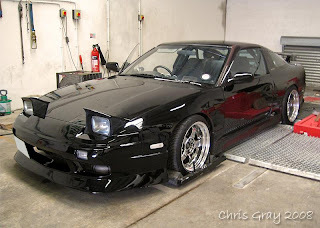 Today I payed a visit to local tuner A.I Autosport for some fine tuning and setup for the 180sx. With a slight 'missing' during/coming on high boost, and AirFlow problem diagnosed before hand, we tried a few adjustments when on the dyno, to try fix the problem and be running 100%. After, AFM, and some fine mapping, then Jonny reprogrammed the HKS EVC Boost controller, everything was running perfect again, and boosting very smoothly and efficient! Great work, making a fast car, faster! Next step was the suspension, for a fine damper tune and setup! 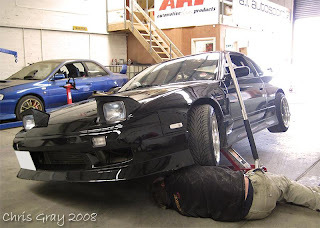 But the 180sx didn't like it, and tried to eat Phil in this photo...haha! 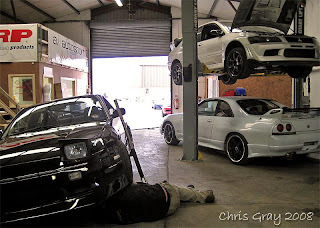 Huge thanks to Jonny and Phil @ A.I Autosport!